Cancer is something most adults don’t like to talk about. So how on earth do you talk to kids about cancer? And how do you talk to your kids about your cancer? We set out to give our kids information, plain and simple. Yes, cancer is a big, scary, emotional word. But kids don’t always know that. Depending on the ages and experiences of your children, they may not even know what cancer is. You don’t have to go into a lot of detail about diagnosis or prognosis. They simply want to know what’s going on and how it will affect them. We used the words “cancer” and “chemotherapy” with our kids so they would know what those words meant when they overheard them in conversation. We explained, “Mommy has something in her body that’s not supposed to be there. It’s called a tumor, and it’s a type of cancer.” We explained the doctors want me to take a type of medicine called “chemotherapy” that we hope will help get rid of the cancer. Cancer and chemotherapy are big words to kids. (Who are we kidding, they’re big words to grown-ups!) They will want to know what that means for them. We explained to our kids what they could expect in the coming weeks: “When I take my medicine, it will make me feel yucky and very tired. It might make me sick to my stomach and would probably make my hair fall out.” (My 6-year-old thought that was hilarious!). We explained people would be helping us by bringing meals and driving them to and from school. We also explained what we expected from them. Kids find security in routine. They need to know things will continue as normal, or what to expect from the new normal. We explained that our day-to-day routines would remain as normal as possible. That meant homework and chores were expected to be done, extra help was appreciated, and life was business as usual (with a lot of extra hugs and fun thrown in!). Kids tend to feel helpless in general…they’re told what to do, when to do it, and how it’s to be done. Add to that a life-altering situation like cancer and kids can quickly feel their helplessness spiraling out of control. As parents we are responsible for our children, yes, but that doesn’t mean we can’t have a little help now and then…especially in the midst of a fight against cancer. In the moments I feel my children need a little extra pick-me-up, I have unashamedly asked friends to take them on play dates, give them some added attention, or simply pray for them specifically as they wrestle through their emotions. A conversation about cancer is not one any parent wants to have with their child, but if the time comes, keep it simple. Give them information and keep the lines of communication open. In a way, kids are a lot like cancer patients…often stronger than we give them credit for. Love this post…great points! Couldn’t help but shed a tear or two thinking about how I thought it would be this huge thing for my kids and when it was kept simple and their routine was maintained, they were so fine. God’s protective hand was certainly over our family as it is over yours as well. Thank you, Kara. That means so much coming from someone who has walked the same road! Oh Nancy, I cannot believe I have just ‘met you’ online. I read your story and now my neck is sore from nodding in agreement. I just spoke to a group of women a couple of weeks ago on ‘hope’ and almost feel like your view on hope was such a reflection of my words. You are one amazing example and servant of the Lord. I am inspired and encouraged. A writer friend of mine just sent me your link. I skipped over to your page where you have poured your heart out so eloquently about your cancer ‘coming back.’ For your sake I am so glad you are blogging. I have been blogging about my cancer now for almost five years. It has surely helped me. God truly opened my eyes and I have learned so much. I pray the same blessing for you. I also wanted to let you know that I have just published a book for children called Mrs. B Has Cancer. I am a writer and a tutor. When I started on my cancer journey I was blown away by the forthright questions my students asked me – i.e. Are you going to die? Will you lose your hair? What are they going to take out of your body? I started writing a book in an attempt to answer such questions. As I wrote it I found myself becoming a little too clinical. Then somehow the book morphed into a fiction book based on my own true story. It is a book geared toward 8-12 year olds and not only addresses questions but also the characters hold a Cancel Cancer party and some other wonderful things. I would be honoured and would LOVE if I could send you a copy of my book. I have ‘liked’ you on Facebook – perhaps we can connect there. 🙂 Here’s a link to my book if you would like to take a peek. http://www.amazon.com/Mrs-Has-Cancer-Glynis-Belec/dp/0992007402. God Bless and all the best as you find strength in the Lord! Glynis, I am SO glad you found me and SO honored that you would have such kind words for my writing and my journey. I would LOVE to read your book. I will e-mail you. Thank you for stopping by and taking the time to connect! These are excellent tips for talking with kids about any major life change!! Thanks for sharing such a great resource for others. Stephanie Kay recently posted…I am thankful for… Cub Scouts. 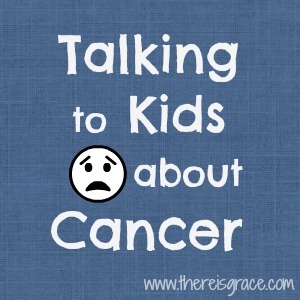 These are wonderful tips for talking to kids about cancer! We’ve actually had several people in our church battle cancer, and our kids like to pray for them. However, I did find it difficult to explain to them what cancer is. Thank you for taking the time to share with us these practical tips! Thank you for stopping by, Caroline! Such helpful information. Pinned to parenting and featuring at Family Fun Friday! Thank you, Monica! And thank you for featuring it at Family Fun Friday! Thank you SO much for linking up this week on Mommy Club Wednesday!We can’t wait to see what neat ideas you may link up in the future! 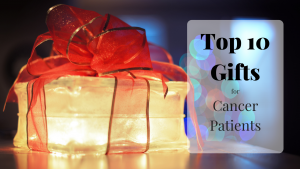 Also- just a heads up I will be featuring this post on this weeks link up- I think it may really help others who need this advice and resource. Thank you for sharing it! Shannon Schmid (@milkandcuddles) recently posted…Gaylord Texan ICE! What it’s like! Thanks for stopping by, Shannon. And thank you for featuring my post at Mommy Club Wednesday! 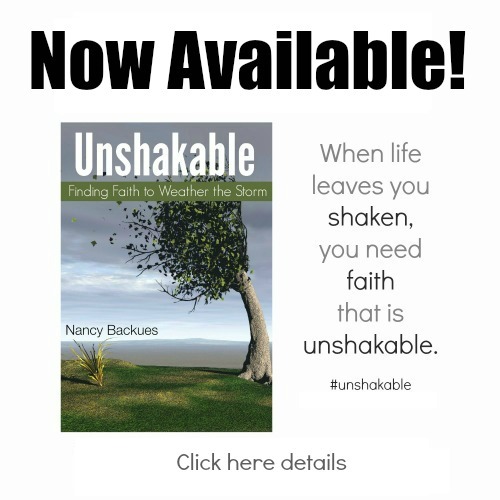 Nancy, I am new to your blog and have already enjoyed reading here so much! This post has given me much to think about, even as an RN. Talking to children is so important and often overlooked. Giving information is vital so our minds don’t work overtime or worry and the chances of misinformation is greatly minimized. Thank you, new friend. Jacqueline, I am so thrilled that you would come, read, and enjoy my blog. I visit yours so often and love what I find there. Thank you for your kind words, I’m so glad you found the post helpful. Welcome, new friend!